Welcome to Nardio Interesting Interview! Pretty often I find myself wanting to know more, about everything, I’m an asker. Our new Interesting Interview comes from Jon Cortazar is founder and CEO of Relevo Videogames. They are the talented team who brought us the very, very fun British Bob the Jumping Craze! If you haven’t already, go buy it. If you’re nervous read our review first, then go buy it! Jon Cortazar is founder and CEO of Relevo Videogames, a Spanish indie development studio that recently hit the AppStore with “British Bob Jumping Craze!” (iOS), a funny platformer in which you take the role of a perfect English gentlemen in a crazy hunt for the stolen tea biscuits. Nardio: What inspired the name “Relevo Videogames”? JC: We had strong roots in the retrogaming and the 8 bit culture, so I was trying to find a name that could reflect our passion about old school games. Actually, it was my wife who finally came with the name “Relevo Videogames”, and I loved it. In Spanish, “Relevo” means “relay”, and so we, as in the relay races, take the baton from the old school developers and try to take it to the next step, working with the same spirit on both vintage and actual platforms. Nardio: As you’ve mentioned, your company works on vintage systems and retro gaming. What influenced you to go in that direction? Nardio: What inspired you to jump into the gaming industry? JC: We first established our studio as a homebrew development team, but later we decided to move into an enterprise and to take our project one more step further. We were known for 8 bit games such as “La Corona Encantada” (MSX/ZX Spectrum) and “Invasion of the Zombie Monsters” (MSX/ZX Spectrum). We were told that both were really polished and near-professional products. Nardio: Do you have a background in game design? JC: Apart from my retrogame developments I’ve been creating, directing and developing gaming and advergaming products for both the web and desktop devices since 2000. Nardio: Will we be seeing more retro style games like Vals Panic coming from your team? JC: You bet! “Vals Panic” (web/iOS) – an advergame based on those early LCD Handhelds-, or “Battle for Asciion” (web/iOS) – an horizontal shooter with no graphics but ASCII characters- are two examples of different ways to give a retro look and feel to a game. For sure, we will keep on exploring new ways to create innovative vintage gaming experiences. Nardio: Can you tell us a bit about what “Advergames” are? JC: Advergames are those games whose main goal is to promote a brand or product. It isn’t only showing the product logo. We incorporate that brand/product into the actual game and try to match the ideas and concept we want to communicate to the desired target. For example, in “Vals Panic”, an advergame created for Vals Agency, we wanted to show the working processes of a little marketing agency in a different and funny way. In “Kar Snatchers” (web/iOS), we promoted an Opel and Chevrolet official dealer with a nice simple game where you guide a Martian with his UFO to abduct as many cars as he can. Also we’ve developed an 8 bit advergame last year, “Azzurro 8Bit Jam” (MSX/ZX Spectrum), for the Azzuro Rock Pub in Bilbao (Spain).In this game you must fight the pub owner in a drinking challenge by drinking color shots in a specific sequence. Making Advergames is quite hard work, because of the deadlines and such. Nardio: How did the idea of British Bob come about? JC: British Bob is a character I created in our homebrew era a couple of years ago. He is a polite English gentleman who fights for the British traditions, always in a funny, non-offensive way. We released “British Bob” for the MSX system, and it was described as a quite polished and funny old school platformer. Later on when we decided to start creating apps for mobile devices I really wanted good old Bob to make a comeback, and finally we’ve managed to do it. Nardio: How long did it take and how large was the staff that created British Bob the Jumping Craze!? 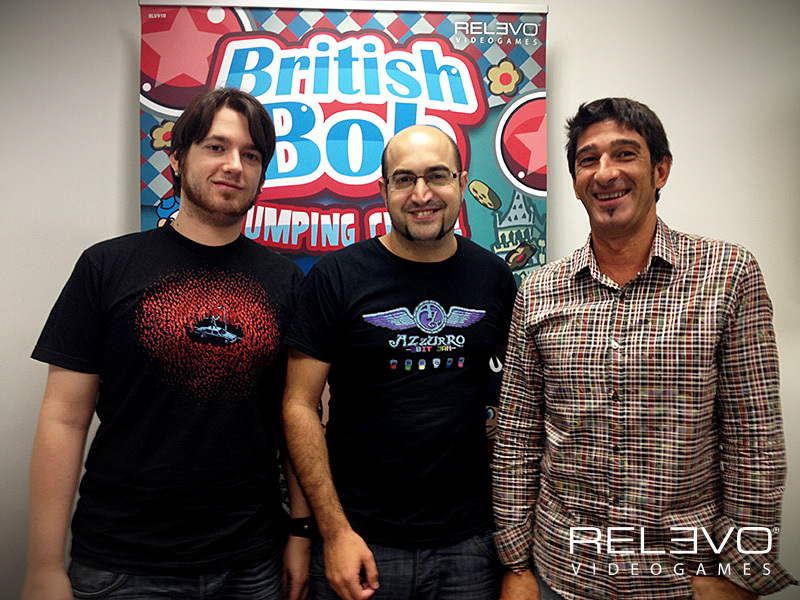 JC: British Bob was created mostly by a three person team: a programmer, an illustrator and animator, and an UI and level designer. Apart from that lead group some others helped on additional design and testing. Background music and sound FX royalties were acquired from a music stock provider. Nardio: What games and movies helped inspire you to create the world of British Bob? JC: The character Bob was created for the very first MSX game. I used to join an IRC channel about MSX development where both developers and users shared their experiences. One of the users (British gentleman) and I used to have fun by teasing each other with both Spanish and English stereotypes. 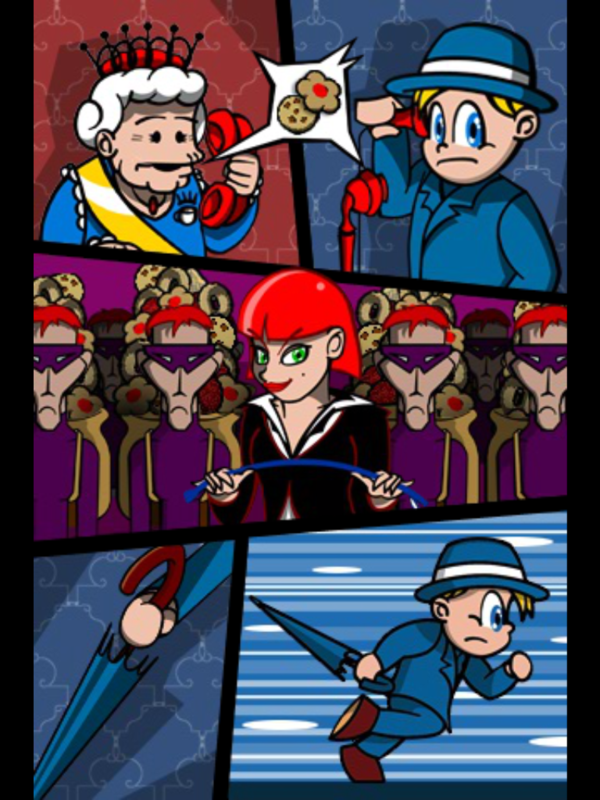 Those funny jokes at the channel were the very origin of creating a game full of British-ness, and so British Bob was born. That’s mostly all about the character: for the in-game mechanics I was inspired by old school platformers such as Manic Miner or Bubble Bobble. 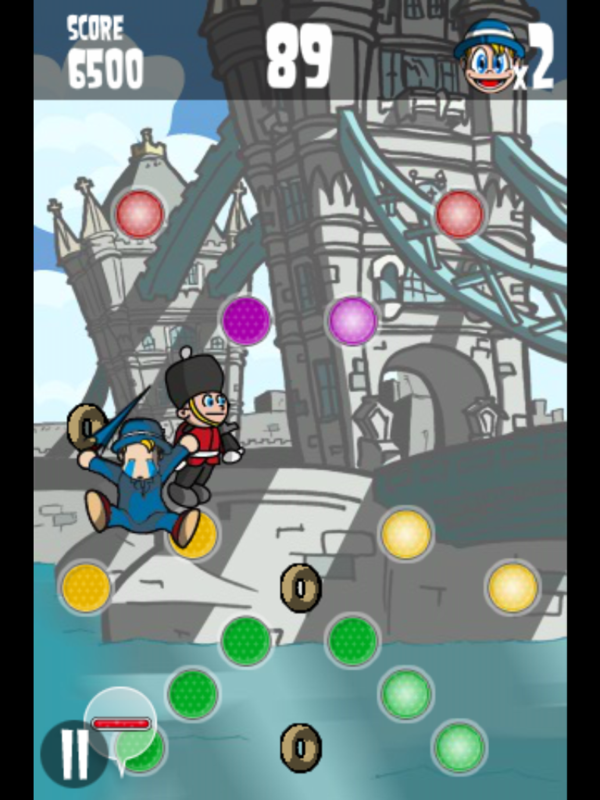 For iOS British Bob I think we made a mix with Brick games, Pinball, Doodle Jump and the original British Bob… sounds weird, but we really think it’s a fun game. Nardio: Why did you decide to keep the game light hearted? JC: We wanted to reach a wider audience by creating a game for everyone. Also, when you are dealing with stereotypes, it is easy to fall into offensive content and that’s something we radically wanted to avoid here. We really just set out to make, a funny and cute game with simple mechanics and full of joy. Nardio: What is the process of designing a level that’s challenging but not frustrating? JC: The key is to give the player the impression that she/he can beat the level…that the level is not impossible or contains something unknown or inconsistent with previously visited levels. A good difficulty and learning curve is one of the biggest challenges when designing a game because if you fail in this aspect you can get a too frustrating or easy game. So it is good to create a learning experience for the user, including new elements inside the game so the player can learn how it works and master it for future game levels. Nardio: At what point did you feel the game was ready to be sold? JC: Once the full engine worked perfectly and every game level was designed and tested, we decided to launch it as it was. It is just a matter of planning, as you can always improve a game. Even during the making of the game you can come up with new ideas about the project, but you need to focus on the original planning, or you can end up with an unfinished project. It’s better to save those add-ons for an update. Nardio: What is the pressure like working on additional content knowing how high the bar you set for yourselves is? Can you tell us a little more about what we could be expecting with the next content update? JC: There are some things we wanted to include, and we will put those things in the new update, such as levers that open doors, or buttons that can pause enemies. Also, a new world with 12 new levels is planned, along with some nice features like a ranking screen for the world’s top ten and some other new things here and there. We hope you like the new update for British Bob Jumping Craze! Nardio: What has your team learned from making British Bob? JC: British Bob Jumping Craze! has been our first commercial release with the potential to garner some attention from the global public. There have been many things we’ve learned in the process of making the game that I could not list them all: we redefined our working process, changed the way we pre-design a game, created so many new coding libraries… in fact, I can say that British Bob is our most professional product and that it changed the way we see development for mobile devices. Nardio: Can you see British Bob turning into a franchise? British Bob cartoon, web comic, toys? JC.- We really love Bob, and we think he has more potential than just an iOS game. We are even considering him to be the star in a collection of games for learning English. For now, we are just focused on the next update for the app, but we are not closing doors to anything right now. Nardio: Why have you avoided in-app purchases? JC: In-App purchases are a nice way to monetize your projects, but depending on how you use them, they can result in a frustrating experience for the player. We are considering adding In-App purchases for future projects, but we really want to avoid the “If you don’t buy you can’t progress” effect. Nardio: What apps do you enjoy playing? Nardio: What else does the staff play/ do for fun when not making a hit game? JC: Hehehe, we have an arcade cabinet here at the studio, so we make score challenges to see who’s better at some retro games. Nardio: What App companies do you look to as an example? JC: We check as many apps as we can to see how people make things, new ways of playability, and also new and original ways of monetizing products. So we are not following specific companies, but the whole market itself. Nardio: As a company that makes App games, can you tell us some of the challenges you might face as opposed to more traditional console / PC gaming company? JC: Big console and PC games need a bigger crew and a higher budget for a decent project. Publishing digital content for the App Store is more affordable for starting indie development studio. But, as a drawback, you enter into a massive market with thousands of products. The visibility of your product is the biggest challenge. So it is easier to publish, but harder to get a payback for your work. I guess that’s the key in mobile app development: how to market your app in order for players to know about your game. Nardio: Your website mentions an upcoming game called Baboon!, can you tell us a bit about it and other future releases? JC: Baboon! is our award winning project from 2011, planned for the end of this year. It will be an app featuring a monkey that has to bomb himself in order to recover his bananas. It will be a funny and entertaining app for the casual gamer, with sharp retina display graphics and lots of levels to play. We are pretty happy about this project and we hope you love it as much as you loved British Bob Jumping Craze!